Here you will be able to find out about the recent projects and activities, which we have been involved in. Look out for 'Class News' here too! On Tuesday 2nd April 2019, Year 5 had the opportunity to visit the Guru Nanak Nishkam Sewak Jatha (Birmingham) Sikh Gurdwara, as part of our recent topic work on Sikhism. 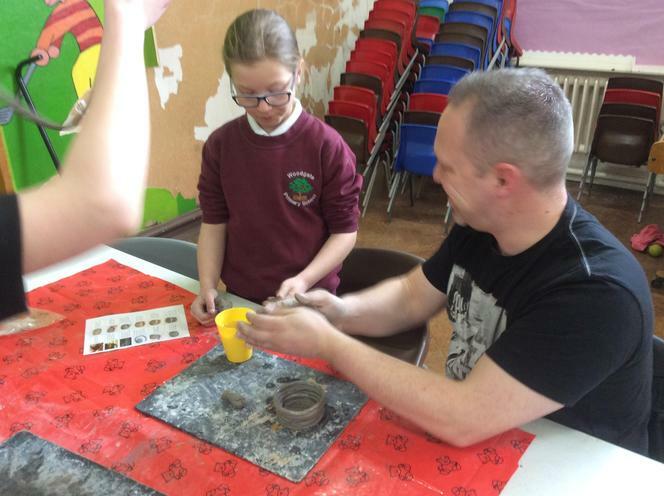 On the morning of Tuesday 26th March, Year 5 invited their parents and carers into school for an Inspire workshop. 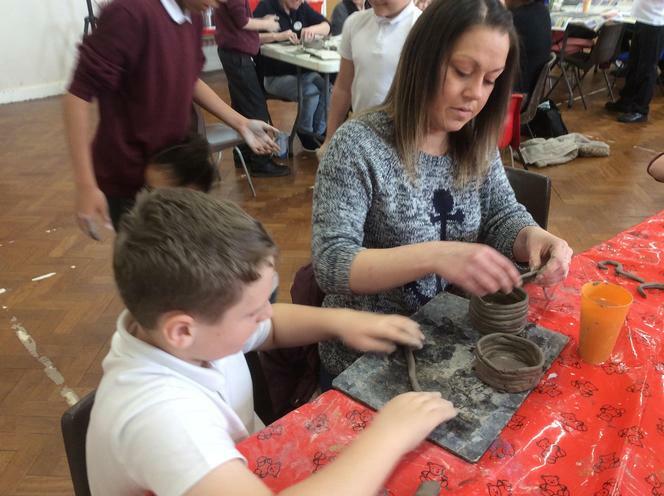 During this session, they were set the challenge of making a clay, coil pot using methods used by the Ancient Greeks. The session was very messy but enjoyed by all! "It was fun to get our hands dirty and create something together we are both proud of." "It was very therapeutic and we enjoyed working together." "We enjoyed working together because we were able to make something together"
"It was fun, my children was able to tell me how he had made a pot in play dough to practice"
"It was fun to work together." "We had quality fun together. 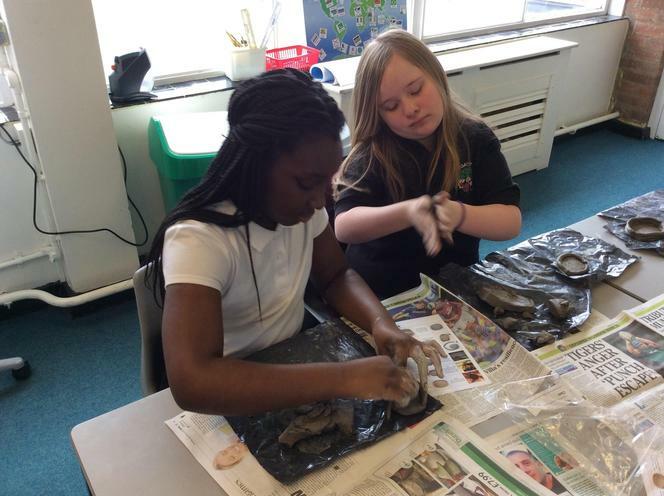 We have used skills which we can now use at home." "We made a really good team." "I was nice to spend quality time together." "It was a great experience to see all the children so happy. " "It was nice to see what happens in school." 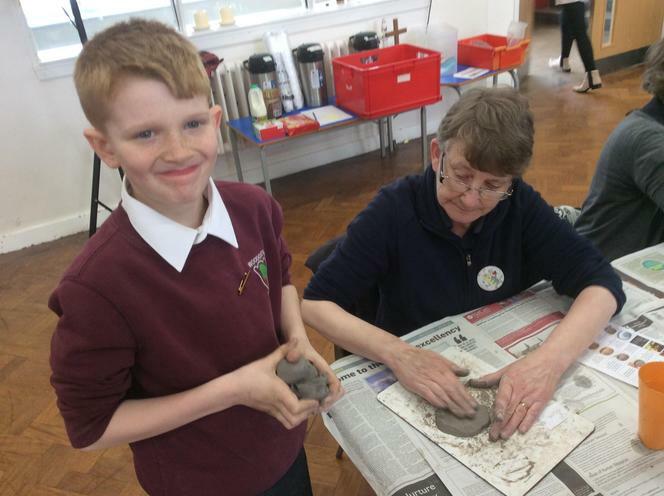 "I enjoyed my mum helping me because it was difficult and we shared ideas." 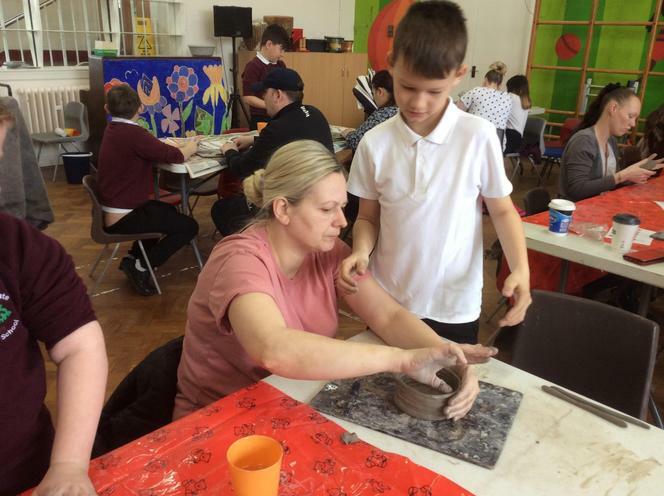 "It was fun and creative and I loved working with my mum"
Here are some tweets of the work we have done at school and at home. We have been trying to raise awareness of the importance of bees, we have even written to our local MP and we are now planning a 'Bee Haven' in our school grounds. In the new year, our main topic will be Ancient Greeks. We will find out about their history, beliefs and culture. We will also be reading some myths and legends and using them to inspire our writing. Mrs Tabberner's group will be continuing their work on fractions. Miss O'Shea and Mr Davis' groups will be continuing their work into multiplying and dividing decimal and whole numbers by 10, 100 and 1000, as well as multiplying up to 4 digit numbers by 2 digit numbers. Finally we will continue our efforts to practice recalling the times table facts up to 12 x 12. We have been busy completing our end of term assessments (Maths, Reading, Writing and SPaG) to demonstrate the skills we have learnt this term. For our Christmas calendars, we have been composing some Cinquain poems about the four seasons. there are three different types of Cinquain poems, which follow strict rules of 5 lines, and centralised. As part of our English Curriculum, we have used the film How To Train your Dragon, as a basis for our work. The children have written in-depth film reviews, summaries (in the form of story maps), character descriptions and setting descriptions. To mark the 100th anniversary of the end of the First World War, we agreed to produce a piece of artwork to go on public display in the school's memory garden. 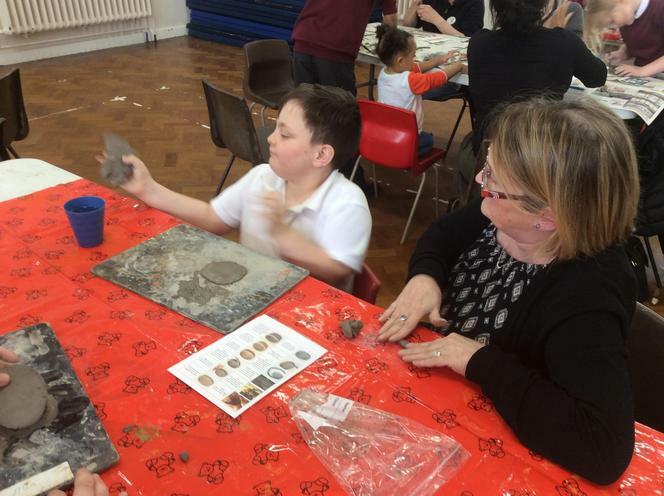 The children set about painting over 100 rocks, with either red or black paint, to create a large poppy and some also painted a poppy design on some of the rocks. Also to mark the anniversary, the school choir performed to family and friends as well as members of the local community during an afternoon concert. During our Black History Month, the children have learned about Benjamin Zephaniah, the famous Birmingham poet and musician, and have written biographies about his life. we found that he left full time education at the age of 13 because of his dyslexia, he moved to London at the age of 22 where he published his first book 'Pen and Rhythm'. Also, thanks to inspiration from a Doctor Who episode, the children were interested in learning about Rosa Parks, a black American woman who refused to give up her bus seat to a white passenger, in the 1950's. This resulted in the Montgomery Bus Boycott, as well as the beginnings of the civil rights movement. The classes have had a fantastic and magical, first hand experience with a theatre production of Awful Auntie Live, at the New Alexandra Theatre in Birmingham. To quote a student's reaction, "I had to rub my eyes when I saw real people acting on the stage". On Wednesday 28th November Year 5 went to the New Alexandra Theatre, Birmingham. We left school promptly at 9am and walked to the bus stop to catch the X22 into town. We travelled for approximately 45 minutes, along the new bus route, until we finally arrived at the theatre. There were lots of other schools arriving at the same time as us, so we had to queue outside to get in. When we eventually got into the theatre, the play (Awful Auntie, by David Walliams) had already started! We had to take our seats in the dark, but we soon settled down and started to enjoy the play. In the book the Awful Auntie - Aunt Alberta – has a pet owl called Wagner; in the play Wagner was actually a puppet which was controlled by one of the actors. However, we didn’t notice the actor much because she was so nimble and discreet. I enjoyed following the story, finding out why Stella Saxby was living alone with her aunt, meeting Soot and watching the amazing scene changes. When the lights came on for the interval I was a little confused, was the play really over already? Miss O’Shea explained that it was a break in the middle of the play called an interval. It was an opportunity for us to have our drink and snack and go to the toilet. We chatted excitedly during the interval and when the house lights went down, the audience went suddenly silent, waiting for the actors to appear on stage again. My favourite part of the play was when the car carrying Stella and Soot fell through the ice – the special effects were amazing, I loved the way the sounds and the video on the floor made it look like the car was going to full through the stage. When the play finished there was lots of audience applause. The lights came on and the theatre become very noisy and busy as we all prepared to leave the auditorium. Miss O’Shea took us down to the front of the stage, so we could see the rows of seats above us, in the dress circle and grand circle. I didn’t realise so many people could fit in the theatre and how high up many of the audience had been. Our trip to the theatre was a fantastic day out. I really enjoyed the play even though I hadn’t read the book (I have read other David Walliams books). I would highly recommend that everyone goes to the theatre to experience Awful Auntie Live. After only two and a half weeks back at school, the children have been enjoying a variety of different learning experiences. In English last week, we were writing letters, to the people who look after us, to encourage us to read at home as part of the new 'Woodgate Reading Ambassadors' project. In Maths, we have explored how to order numbers, use column addition, cube and square numbers as well as how to find multiples and factors of numbers. In PE, we have practiced our cross country running, in preparation for a local schools competition, in which we came a good second! We have also had great success making sure that we know our times tables, through a variety of methods, including using songs! In Science, we have explored our solar system, which included a practical lesson where we went onto the playground, marked out the solar system and then demonstrated the orbits, using ourselves as the planets. So far, we have found out a great deal of information about our current topic, the Vikings, such as: they came to Britain in 793AD, from Sweden, Norway and Denmark (Scandinavian countries) using ships called long ships, which were shallow, wooden boats powered by sails and oars. They did not wear helmets with horns; however, they had chainmail armour and a large wooden shield, usually accompanied with a battle axe! We are looking forward to our upcoming swimming lessons, which we will be taking part in all year. We are looking forward to this because it is a fantastic life skill to have and because it is a good sport to take part in. We are also looking forward to going on many tremendous trips which will help us in our topic work (Vikings, Ancient Greeks and Normans). Maths homework is set by all three teachers on a Wednesday and is due back in on the following Wednesday, where the pupils will have the opportunity to mark their own work. Spellings are set by all three teachers on a Monday and are tested on the following Monday, where the pupils will have the opportunity to mark their own work. Mr Davis' spelling group are given 1, 2 or 3 house points for achieving 8, 9 or 10 out of 10 respectively. Starting Thursday 27th September, your child will have swimming lessons until the end of year 5, unless specified. Please ensure that your child brings his/her swimming costume and towel into school every Thursday. Earrings will need to be removed and long hair tied back during swimming. Goggles, unless prescription, are not to be used. Dance Mat Typing: Learn to type by having fun!